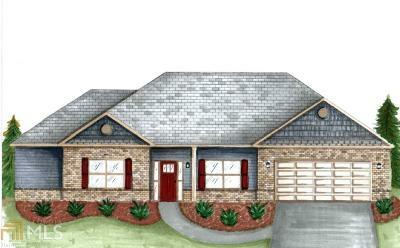 The Eleanor- stepless ranch 2,387 sf. 4 BR, 3 full baths - open concept kitchen|family room, breakfast nook & separate dining room. Kitchen has a 9 ft island, wood cabinets, granite counters, tile backsplash, stainless appliances & a butlers pantry. The master- trey ceilings, crown molding, walk in double sided closet. The master bath- double vanity, dual sinks, tiled bathroom, granite countertops, tiled separate shower & garden tub. Hardwood floors in all living areas, hardwired for security, wood burning fireplace, Hardi plank siding, rear patio & covered front porch, home sits on a 1.02 acre lot in a quiet cul-de-sac. Home includes termite protection & a warranty. Builder contributes $2,500 & Lender contribute $1,500 with use of builders preferred lender.